A variety of French fruit tarts are popular in Morocco, but given a choice, I'll always choose Tarte aux Pommes over other offerings. Thinly sliced apples are tossed with sugar and a little bit of cinnamon, and then attractively layered in a sweet pastry shell lined with pastry cream (creme patisserie). Baking caramelizes the apples, while an apricot glaze adds sheen and a bit of tartness to the finished dessert. Although the flavors are similar, this is not as quick to throw together as American style apple pie. 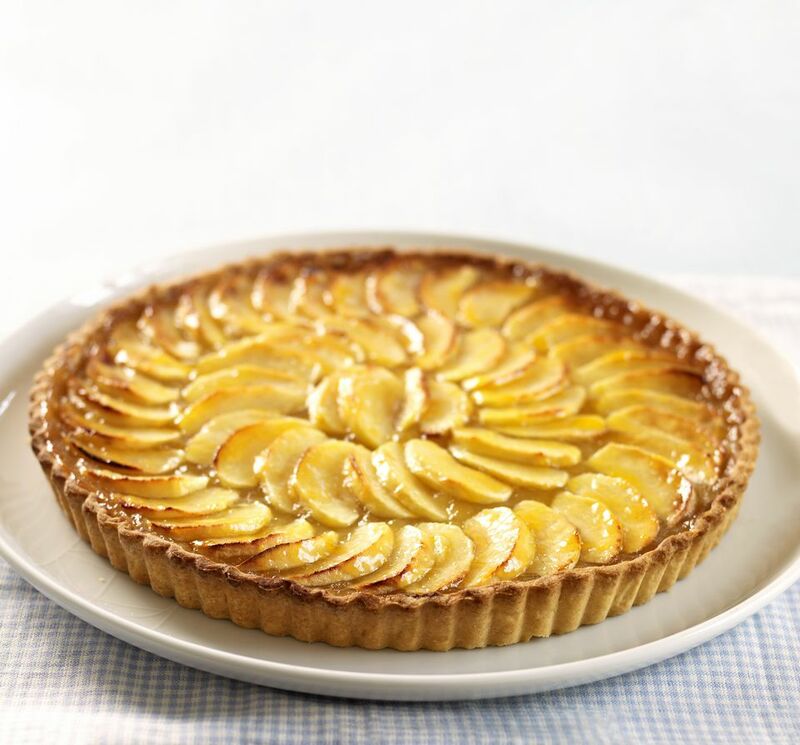 Not only will you need to give a little more care to how you slice and arrange the apples, but you'll need to plan ahead to make both the pastry cream and pastry dough well in advance of assembling the tart. The sugar quantity in the pastry recipe below is for a less sweet shortcrust; if you'd prefer a sweeter pastry dough, follow the pate sucree recipe instead. Note that prep and cooking times below do not reflect two hours or more chilling time for the pastry dough. Alternate versions of this recipe include the French strawberry tart and ​the ​​French peach tart. Note: while there are multiple steps to this recipe, this French apple tart is broken down into workable categories to help you better plan for preparation and baking. Add the butter and work it into the flour mixture with your fingers or a pastry cutter. Work in the egg yolk until the mixture looks like a fine meal. Then use a fork to stir in ice water, one tablespoon at a time, until the dough can be gathered together and pressed into a ball. Shape and flatten the dough into a smooth disc shape, wrap in plastic, and refrigerate for 2 hours or overnight. In a large bowl, whisk together the egg yolks and sugar. Whisk in the flour and cornstarch until smooth; set aside. In a saucepan, heat the milk with vanilla bean almost to boiling. Remove the vanilla bean, then slowly and gradually whisk the milk into the egg mixture. Strain the mixture back into the saucepan. Bring heat to a boil, whisking or stirring constantly while the mixture thickens and reaches a boil. Continue cooking for another half minute while stirring, then remove from the heat. Lay a piece of plastic film on the surface of the pastry cream and allow it to cool completely before using or chilling. Place the slices in a bowl and toss gently with the sugar and cinnamon. If the apples start to brown, you can toss in a tablespoon of lemon juice. Roll out the pastry and fit into a 9-inch tart pan, trimming the excess dough. Spread the pastry cream across the bottom of the pastry shell. Arrange the apple slices in a pattern over the pastry cream and dot the apples with tiny bits of butter. Wrap strips of aluminum foil around the edges of the tart pan to protect the crust from burning. Bake the tart in the preheated oven for about 40 minutes. Remove the foil, and continue baking for another 10 minutes, or until the apples and crust are nicely colored. Remove the tart to a rack to cool. While the tart is still warm, heat the apricot jam with the lemon juice until boiling. Then use a pastry brush to apply the apricot glaze over the apples. Refrigerate the tart when it has cooled completely.